Catch Machine - Classic - catchmachines Webseite! 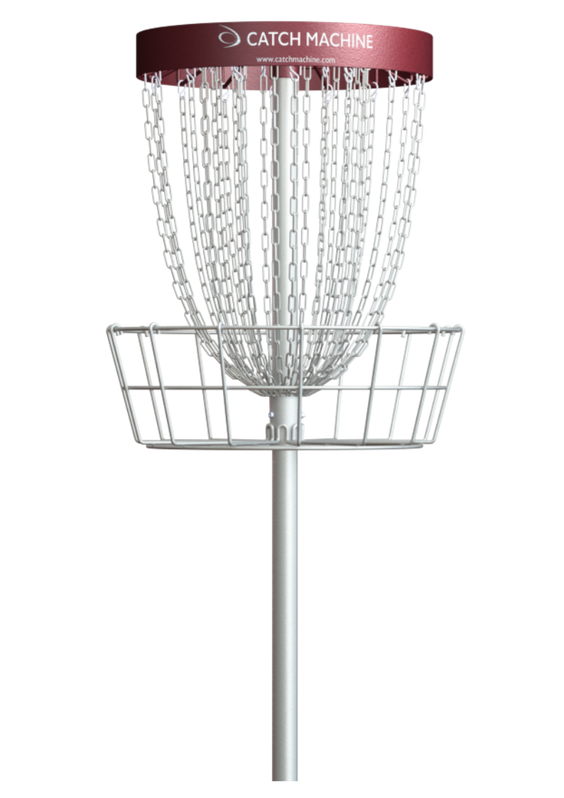 This disc golf basket offers everything, what is expected from a modern product in classic design. Developed for top quality and durability, this basket also makes a great visual impression. Complete hot-dip galvanizing of the basket, top rack, pole and all chains as well as stainless connecting elements are obvious, the powder coating of the top rack is UV-resistant. Merchantable are 24 to 28 chains arranged in 2 rows. Increasing to 32 chains while adapting the weight concurrently ensures a smoother disc catching behaviour because of the tighter chain arrangement. The robust construction provides stability and thus high durabilty. The classic version of the Catch Machine is primarily recommended for schools and recreational parcours on public locations. Floor fixing: options see "Equipment"